1. Electricity does not follow the path of least resistance…it follows all paths…this means ALL LINES ARE HOT! 2. Whenever a responder is electrocuted or shocked it’s all about potential. Potential is the difference between two energized if it exists then electricity flows from High voltage to the lower voltage. There are two potentials; Step and Touch. TOUCH POTENTIAL is contacting an energized source when current flows through usually to ground. STEP POTENTIAL occurs when one foot is closer to downed wire (higher voltage) and the other foot is further away (lower voltage). Current flows up one leg and down the other. ALWAYS WATCH FOR POTENTIALS! 3. Current flows through conductors – NEVER BECOME A CONDUCTOR! Remember, current is amperage and amperage kill. It only takes 1/10 of an amp to send your heart into fibrillation. 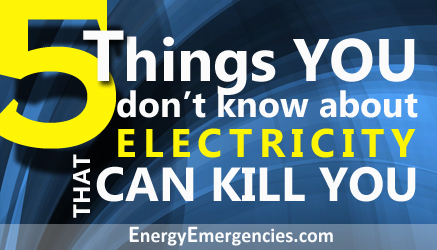 The best way to prevent electrocution or shock is to recognize potential and avoid being a conductor. Another way to increase safety is to protect your self with resistance. Linemen have resistant tools and PPE but even they know given enough voltage any resistance can be overcome! 4. Distance is the best Resistance 50,000 volts can jump 10 feet and the more voltage the more likely an arc becomes. Always keep a minimum of 10 feet between yourself and any wires. In smoke, rain or inclement weather increase the distance. It is sure and simple that the further back you are the safer you become. 5. Backfeed Alternative energy increases the chance of backfeed. With the extensive expansion of distributed electrical generation such as generators, solar and wind power the chances of back feed has gone up for lineman and responders. Generators, solar systems and wind power all generate enough electricity current. If the system is not correctly installed it can feed electricity back into the grid and create a backfeed hazard.